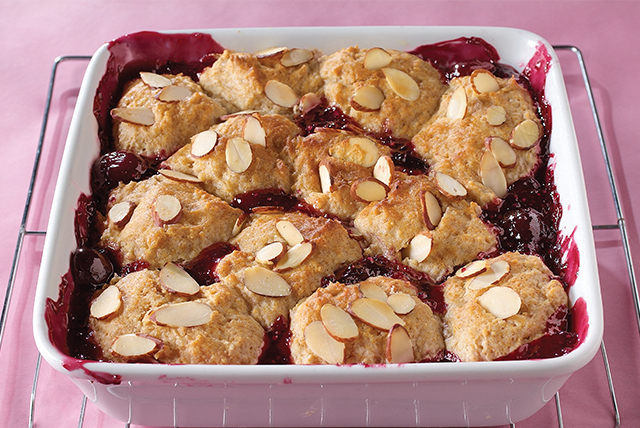 Discover the deliciousness of our brilliant Bing Cherry Cobbler! No one will know this cherry cobbler is a Healthy Living dessert unless you tell them. Preheat oven to 375°F. Set aside 2 Tbsp. of the sugar for later use. Mix the remaining sugar and tapioca in large saucepan; stir in water and lemon juice. Bring to boil. Add cherries; cook 2 min., stirring frequently. Pour into lightly greased 8- or 9-inch square baking dish. Stir baking mix, reserved 2 Tbsp. sugar, the cinnamon and milk in medium bowl until mixture forms soft dough. Drop by heaping tablespoonfuls onto hot fruit mixture. Sprinkle with almonds. Bake 28 to 30 min. or until biscuit topping is golden brown. Cool 10 min. Cover and refrigerate any leftover cobbler. Top each serving with a dollop of thawed COOL WHIP LITE Whipped Topping or a small scoop of frozen vanilla low-fat yogurt. Makes 9 servings, about 1/2 cup each.